That wasn’t possible. There was just too much damage to repair and Downey loaded up. There are many ways to prepare a car for time trials. Bouncing it off the wall usually isn’t one that turns out to be very successful. Yet that is exactly what Scott Carlson did in his #38 at Music City Motorplex on the way to earning the pole position for the All American 300. Carlson went out late in qualifying and laid down a lap of 18.453 seconds. Before time trials even began, Brent Downey was loaded up and headed home. The young Indiana driver was the victim of circumstance when Jeremy Pate got loose under him going into turn three during practice. Downey’s #25 car backed into the wall hard. He was uninjured, but the same couldn’t be said for his car. Downey and his team hoped to be able to repair the car when it was first towed into the pits. Carlson’s trip into the wall was bigger than just a tap. With some more time to fine-tune the car before Sunday afternoon’s feature, Carlson likes his chances – and the tools that he has at his disposal. “I’ll tell you, we’ve still got some work to do on it before the race, but I’m proud of my guys. They worked hard. The Jeff Hamner engine, Lefthander Chassis and Five Star Body…you couldn’t ask for anything better. Other than the pole position, the most sought after spot in qualifying was 24th. That was the cut-off point for cars that made it in through time trials and cars that needed a provisional and good finish in the last chance race to make it to the big show. David Hole qualified 24th and he couldn’t have been happier after qualifying. Hole and his team anxiously watched the last few cars qualify from on top of the pit wall. The #14 team of Ken McFarland had plenty of drivers in their pit area. Super Late Model drivers Josh Hamner and Jon Boy Wilkerson were both on hand to assist the Alabama driver since they did not enter their own cars in the race. McFarland qualified outside of the top 24, but was awarded a Southern All Stars provisional and will start 27th. It doesn’t matter whose car J.R. Norris is driving at Music City Motorplex. He’s a sure bet to be fast and has proven that in his own car and equipment owned by Richie Wauters. 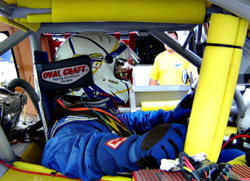 This weekend, he was behind the wheel of a blue #16 owned by Bob Blount. Norris qualified on the outside pole, only 1/100th of a second slower than Scott Carlson. The young driver had mixed feelings about that. “We have a good position for the race, so that’s what we wanted,” said Norris. “It just kind of upsets me because this is what happened to me two years ago. I had the pole and Eddie Hoffman was the second to last car to go and he did the same thing. It happens. It’s qualifying, but we still have 300 laps to go. We’ve got a really good car for the race, I’m sure about that. “These guys worked their tails off since we got here. Trying this and trying that. They are the reason why the car is so good. Without them, we wouldn’t have been able to try as much and get the car as it is. Surprisingly, Norris did not have a monster motor in his car, taking advantage of a spec motor that will be phased into the ASA Late Model South Series next season. Dan Fredickson won one of two last chance races to earn his way into the field. The Minnesota driver wasn’t happy about being a tick off in qualifying, but turned his day around with the consi victory. “It went good all things considered, but being in the last chance race isn’t where you want to be,” said Frederickson. Just getting the car to the track was plenty of work for Frederickson and his #36 team. When asked when the car was finally finished, Frederickson had a surprising answer. Following Frederickson to the finish in his heat race were Keith Cahlea and Jason Shivley. Wisconsinite Dexter Bean drove his #125 to victory in the other last chance race ahead of Eddie Mercer and Dennis Schoenfeld. The top three finishers in each race advanced to Sunday’s main event. There were also three provisionals available each to the CRA Super Series and Southern All Stars series. The SAS provisionals went to their 2005 champion Matt Hawkins, Ken MacFarland and Johnny Brazier. The CRA provisionals went to Eddie Van Meter, Chris Gabehart and J.R. Roahrig. Two promoter’s choices were added to the field as well. Sammy Sanders and Randy Pedley took advantage of that decision and will start in the final row for Sunday’s race. David Hole in his office. 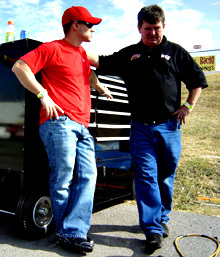 J.R. Norris (L) and his car owner Bob Blount. Frederickson's #36 car heads to victory in the last chance race. Eddie Mercer (#72) and Dennis Schoenfeld (#43) put on a good battle for second and third in the other last chance race.